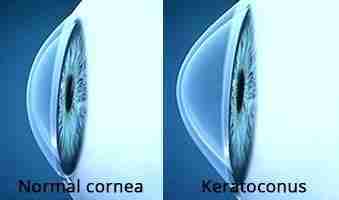 Keratoconus is a progressive disease of the cornea in which the cornea bulges out like a cone and becomes thinner over time. Patients with keratoconus usually will not be able to obtain 20/20 vision through their glasses and will experience more blurry and distorted vision over time. Their prescription will most likely be very high in nearsighted and astigmatism power. However, the use of specialty contact lenses is the best option for patients with keratoconus. In fact, their vision will sometimes be even better than with eye glasses. These lenses are customized to precisely fit their eyes only. Dr. Cheung has extensive experience with keratoconus and is very knowledgeable in all of the latest advances in keratoconus contact lens designs including rigid gas permeable (hard) contact lenses, hybrid contact lenses, and scleral contact lenses. She is available to screen and evaluate for keratoconus and will recommend the best option for your eyes. If the condition is in a more advanced stage, there are many surgical treatment options that she can also discuss further with you. Dr. Cheung co-manages with the best surgeons in town for procedures such as corneal cross linking, Intacs ring implants and even corneal transplantation. Certain insurance companies, such as VSP, consider keratoconus contact lens evaluation and keratoconus contact lenses “medically necessary” in which case they provide benefits for these services and materials with minimal out-of-pocket cost. Contact our office today to schedule a keratoconus contact lens evaluation today.